Finding a good application architecture is not easy, but defining an architecture for your application is important: like it or not, every application is going to have an architecture. There is no such thing as the Best Architecture, but there is the Best Architecture for your current application! (finish the project on time, with quality, less bugs as possible - no bugs preferred :) - and easy collaboration with your teammates). Flux is the application architecture that Facebook uses to structure client-side web applications, is very simple to understand and there is almost no code for it. It's just a way to do things. It’s a Clean Architecture so it’s not intended only for web apps, but its features and simplicity will allow us to adapt it very well to other kind of projects. I believe Flux is very good choice. Base Flux concepts, I created a project on Github Delphi-Flux-Seed. This project is an application skeleton to apply Flux concepts in Delphi applications. You can use it to quickly bootstrap your Delphi application. 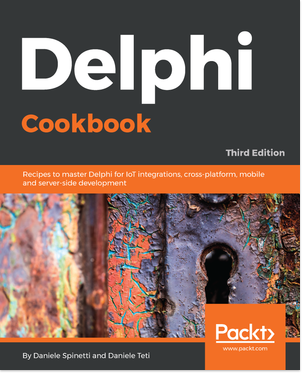 This book is the 3rd edition of the Delphi Cookbook serie: Delphi Cookbook is a best sellers for PacktPub (the editor) in its category, so the editor decided to ask me a 3rd edition in co-authorimg with Daniele Teti (author of the 2 previous versions). So here it is! In this third edition we wanted to add content to keep the book updated with emerging technologies and new features made available by Delphi: there are 2 chapters completely new, one for Linux Development and one for Integration with IoT, added useful chapters on FireDAC and RTTI attributes. Furthermore, this edition contains all the recipes from the previous editions updated to the new Delphi 10.2 Tokyo: reaching 780 pages for 78 recipes! It is not an introductory book, you will not find any “Introduction to the Object Pascal language”, however the majority of the chapters are not too complex and can be grasped also by the new Delphi programmers. Another interesting thing is that thanks to the release of the Delphi Community Edition (you do not know what it is ?? go here ...) all chapters except chapters 6 and 7 can be addressed through the use of this free version. For chapters 6 and 7, as it is Linux and server-side development, the Enterprise version of Delphi is required. The book is available for sale on the editor website and on Amazon. Tomorrow November 7th will see the 12th edition of Embarcadero's yearly online conference, called "CodeRage". Furthermore two guess industry luminaries will be giving sessions, Robert Martin (aka Uncle Bob) is speaking on "The Clean Coder - An Introduction to Software Professionalism" and Steven McConnell (of "Code Complete" fame) is speaking on "Managing Technical Debt". You can see the full program at: https://community.embarcadero.com/blogs/entry/coderage-xii-sessions-and-schedule. I'm very excited because it's the first time that I will participate in the conference as speaker! I’ll be talking at CodeRage XII about "How to develop a simple recommender system". What do Netflix, Amazon, Google and Facebook have in common? An efficient system of recommendations. In this session I'll show how to implement a simple system of recommendations with Delphi and Redis ... in a very simple way! Based on this work, a new product is coming to predict what you customer want! Because knowing users to propose the right product for each of them is crucial in all types of sales. If you are interested contact me or stay tuned on bit Time Professionals.